Today’s image for Day 249 of VM_365 shows the Manston Beaker burial under excavation in 1987. The burial was contained within a grave located centrally within a roughly oval shaped barrow. The crouched skeleton of a slightly built young adult was accompanied by a long-necked beaker, a flint knife and a jet button. The picture on the right hand side shows the burial during excavation with the beaker on the left side of the pelvis. A secondary crouched burial had also been inserted on the inner edge of the ring ditch to the south of the central grave. The central grave had apparently been disturbed, possibly by a later burial inserted into the barrow mound, maybe during the Anglo Saxon period, as parts of the skull were missing and a fragment of femur unrelated to this skeleton was found in the backfill above. Radiocarbon dating carried out on the right femur of the skeleton dates the burial to 1680±50 bc (2132-1922 years BC) which places it at the beginning of the early Bronze Age. The image for Day 228 of the VM_365 project is of a resource the Trust has created for teaching some of the themes of prehistory in primary school workshops, a table top Beaker burial given its first trial recently at a primary school in Broadstairs. The tabletop layout includes a skeleton in a crouched position, accompanied by a replica Beaker vessel and a contemporary barbed-and-tanged arrowhead. One element of the workshop is a discussion of pre-history as an idea, drawing out the sense that it describes periods in the development of human societies where no stories told directly by the people themselves exist. Studying prehistoric periods requires a process of investigation, based on the observation of objects and the circumstances of discovery. To generate narratives from the evidence requires imagination to draw out associations and analogies with contemporary life experiences. The burial and accompanying objects create a detailed scenario to provoke discussion and demonstrate how archaeologists have used the detailed investigation of the pottery, flintwork and the human remains separately to provide data. Revealing the burial from under its covering of grassy topsoil (top images) adds a sense of the theatre of discovery which is such a part of the archaeological investigation process. 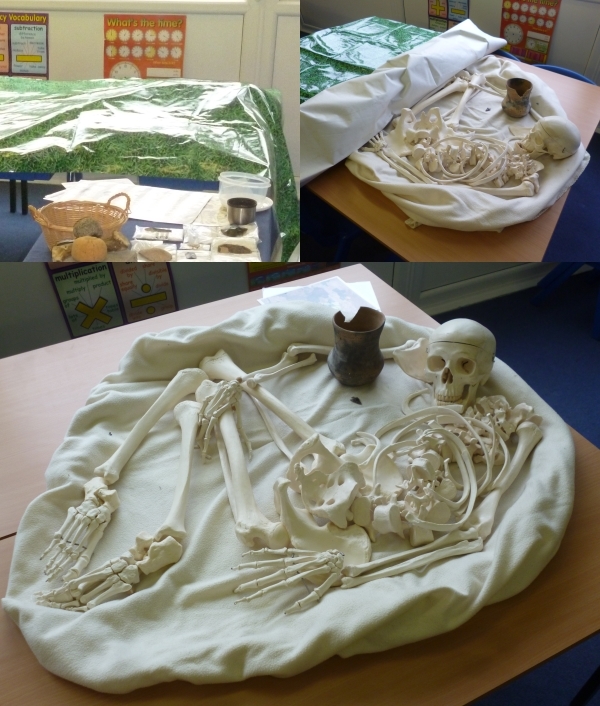 The combination of the artefacts and the burial into a recognisable archaeological scenario gives the children an insight into the practical circumstances of investigation where archaeologists generate their data. They can take part themselves in creating and debating their own versions of the narrative of the burial. For an archaeologist well versed in the complexities of theoretical approaches to prehistory and the interpretative models and debates that are generated from them, it is fascinating to see these same arguments arise among such young minds based on the first principles of observation and imagination provoked by a Beaker burial presented in their own classroom. The image for Day 213 of the VM_365 project is one of our pictures from the slide archive collection. Taken in 1987, it shows the Manston Beaker prior to its restoration. The Beaker, previously featured on Day 161, was found resting on its side and was lifted on site in a block of soil, tightly wrapped in bubble wrap, before being transported back to the laboratory where it was excavated from its soil block. This picture shows the base of the beaker during cleaning. We often forget when we see an object cleaned up and on display how many stages it may have gone through to get to that condition. In the case of this Manston Beaker it involved the heavy restoration of its missing parts and decorative pattern. 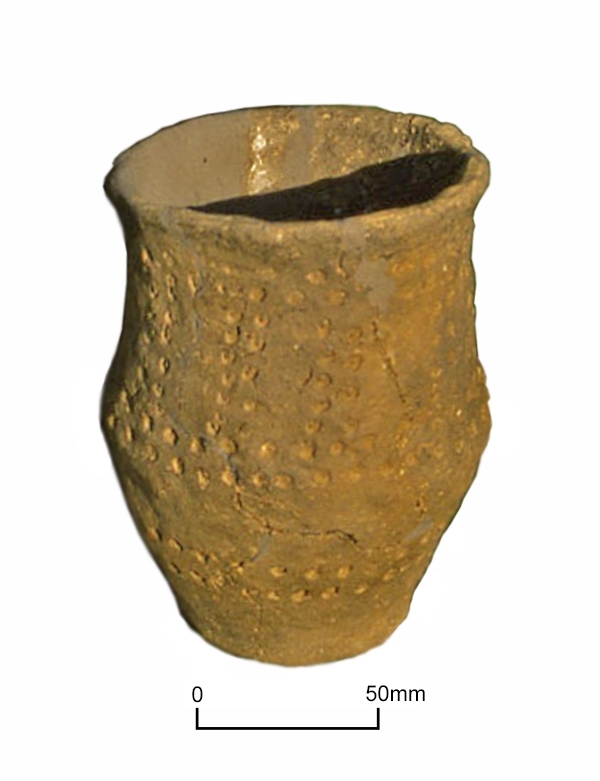 Today’s image for VM_365 Day 203 is of aLate Neolithic/Early Bronze Age Beaker, found in an excavation at South Dumpton Down near Broadstairs in 1992, which was led by David Perkins, the first director of the Trust for Thanet Archaeology. The beaker was found among a complex group of graves that were enclosed by the ring ditch of a roundbarrow. The graves that were excavated at the centre of the ring ditch contained the remains of seven individuals laid in a variety of orientations. Some of the burials were in crouched positions, others were truncated and disarticulated. The complexity of the grave group led to some confusion about what the exact association was between the Beaker and any of the individuals in the grave group. 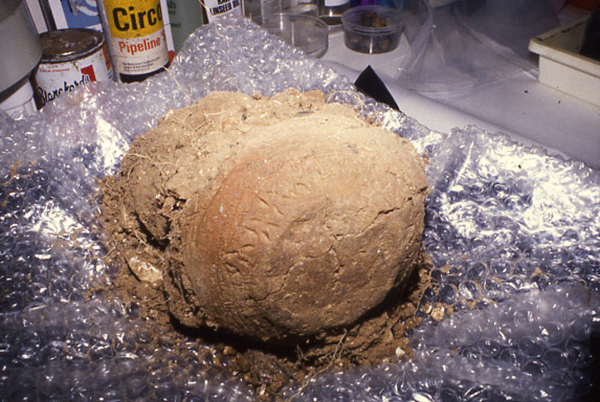 The confusion was aggravated by the presence of Food Vessel type pottery within the grave group, which is not often associated with Beaker graves. Recent reflection on the exact sequence of events represented by the deposits that were excavated and the initial interpretation made of them, points to the probability that the burial sequence was not properly understood. It seems that the graves within the barrow accumulated over a period of time, cutting through earlier burials and truncating them. The earliest of the graves appears to be that of an adult buried on its left hand side in a rectangular grave, accompanied by the Beaker. This fits recent discoveries of Beaker burials in Thanet, which generally seem have been made in well cut rectangular graves, probably enclosing a coffin or chamber. The Beaker is quite crudely made in comparison with vessels like the one from North Foreland shown in VM_365 Day 176, with an unusual scheme of impressed decoration with possible connections to the Netherland’s ‘Potbeker‘ tradition. In the classificatory models that have been proposed for Beakers it belongs to Clarke’s Mid Rhine Group, or Lanting and Van der Waals‘ (1972) Step 3 classification. 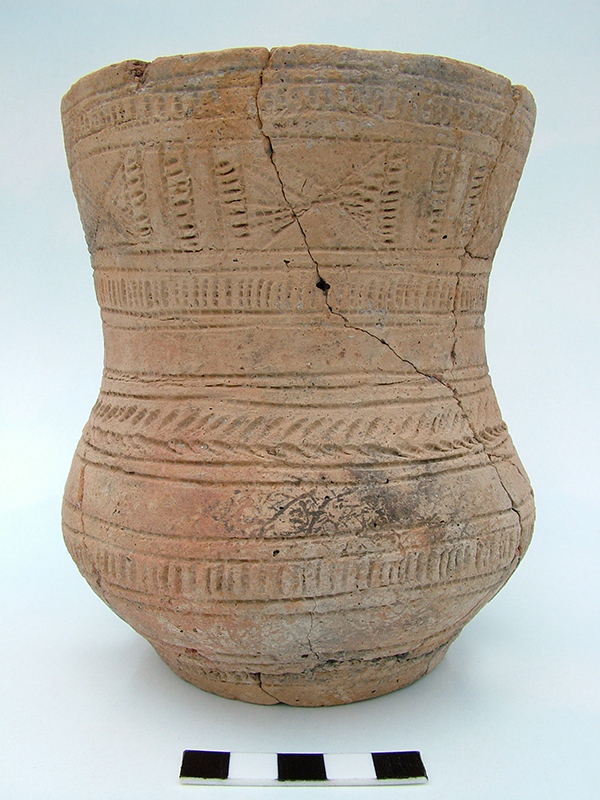 The South Dumpton Down Beaker is currently on long term loan to Dover Museum and can be seen in the Bronze Age gallery at the Museum. More information on Thanet’s Beakers can be found in the Beaker gallery of the Trust’s Virtual Museum. 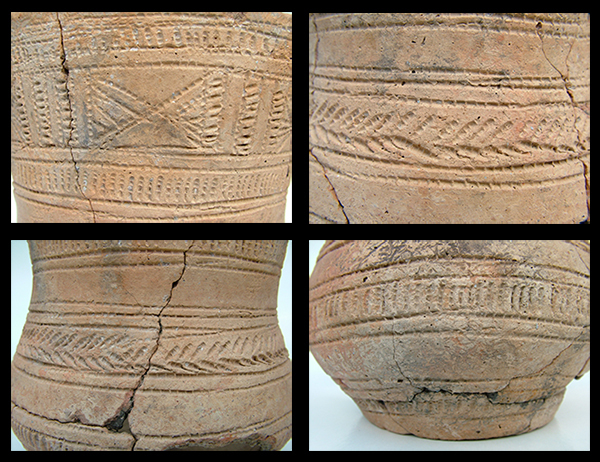 Our image for Day 177 of the VM_365 project shows four close up pictures of the decoration on the body of the Beaker vessel from North Foreland shown yesterday for Day 176. The first impression is that this vessel looks like a very finely and carefully decorated pot but if you look closely you can see that this is not the case because there are some errors in the execution of the decoration. The decoration was applied using a comb with square-sectioned teeth and is arranged in four zones. The neck (top left) is decorated with opposed filled triangles bordered above and below by a ladder pattern defined by encircling combed lines. The triangles are separated from each other by three vertical ladder motifs. The waist decoration (top right and bottom left) is separated from the neck decoration by a plain band approximatley 1 cm deep. The waist is made up of a band of herringbone motif bordered above by three, and below, by two encircling lines. There is overlapping in the decoration. The belly (bottom right) is decorated with a ladder motif and is separated from the waist by another plain band and is encircled above and below by two lines. The base decoration (Bottom right) is separated from the belly by an undecorated band and comprises a zone of ladder pattern similar to the belly but more untidy where there seems to have been an attempt at forming three encircling lines above and two below but the execution is careless and there is overlap between the horizontal and vertical elements. The lower part of the vessel is undecorated. How did the potters decide how to divide up the vessel into decorative areas and what patterns to apply? Did they use mathematical principles to divide up the circular space or were there rules of thumb that made the job easier? Perhaps we will never know. Gibson, A. 2005. The Beaker and other Pottery from Beaufort, North Foreland, Broadstairs, Kent. Unpublished Pottery Report. The image for Day 176 of the VM_365 project shows a Beaker vessel dating between 1900-1700BC excavated from a grave at North Foreland, Broadstairs in 2004. The vessel accompanied the crouched inhumation of a female aged over 40 years old who had been buried in a large pit cut into the chalk, around which a ring ditch had been excavated. The Beaker had been placed at her feet and a small flint scraper may have been placed near her head. The Beaker is of the S2 type series, similar to the example found at Manston and has been decorated in four zones using a comb. It is made of very hard, well fired fabric that has been rapidly open fired. An old break at the base shows possible traces of coil or ring construction.